The latest deals and must have offers from Swych! 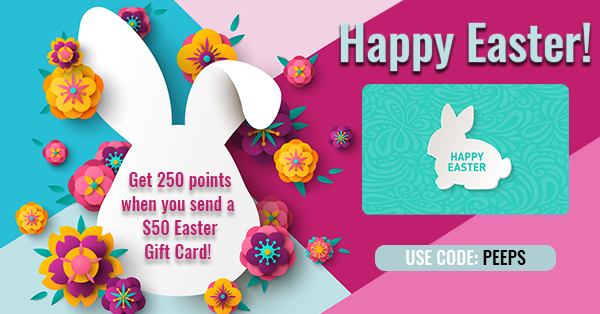 Use code PEEPS when you send a Happy Easter Swychable Gift Card of $50 or more to receive 250 points toward a future purchase. To redeem in the Swych app, apply the code in the promo box at checkout. Cannot be combined with any additional offers. This promo ends April 21, 2019, at 11:59 pm Pacific, and is limited to two per customer while supplies last. Points will be awarded to your account within 72 hours of purchase. When sending gift cards, please allow the Swych app access to your contacts when asked. We respect your privacy and do not store your contacts’ information. Gift cards can only be sent to U.S. mobile numbers (not available for e-mail addresses, VOIP, Google phone, or international mobile number delivery). Swych has the right to change, alter or terminate the promotion at any time. This promotion is intended for Swych app users. The occasion cards can only be exchanged for brands available within the Swych app. There are no services fees or dormancy fees assessed against a Swych card. Values can only be applied toward the purchase of brands available within the Swych network. Terms and conditions of the individually purchased brands will apply on final redemption of the Swych card. 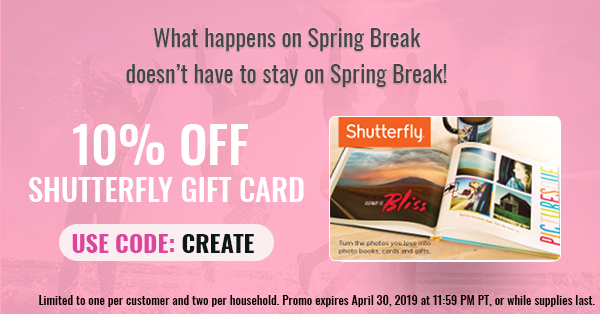 OFFER DETAILS: Use code CREATE when you buy a Shutterfly gift card and save 10% on amounts up to $50. To redeem in the Swych app, apply the code in the promo box at checkout. Cannot be combined with any additional offers. This promo ends April 30, 2019, at 11:59 pm Pacific, and is limited to one per customer and two per household while supplies last. Swych has the right to change, alter, or terminate the promotion at any time. This promotion is intended for Swych app users. 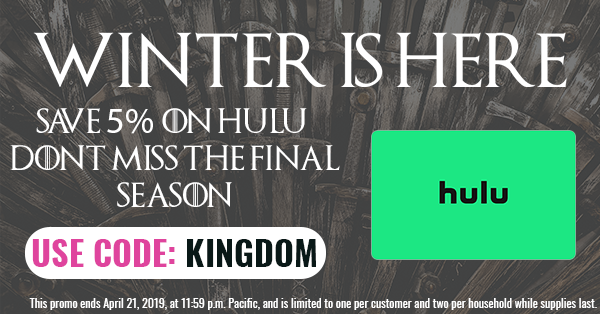 OFFER DETAILS: Use code KINGDOM to save 5% when you purchase a HULU gift card. To redeem in the Swych app, apply the code in the promo box at checkout. Cannot be combined with any additional offers. This promo ends April 21, 2019, at 11:59 p.m. Pacific, and is limited to one per customer and two per household while supplies last. Swych has the right to change, alter, or terminate the promotion at any time. This promotion is intended for Swych app users. 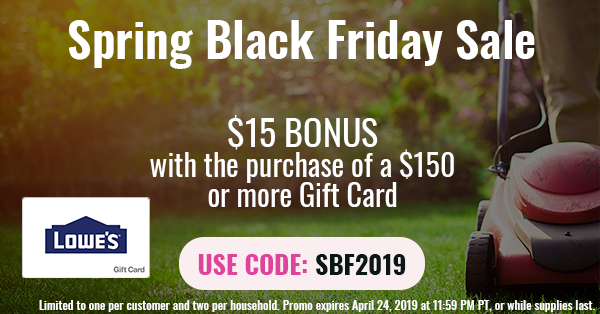 Use code SBF2019 when you purchase a Lowe’s Gift Card of $150 or more and receive a $15 bonus. To redeem in the Swych app, apply the code in the promo box at checkout. Cannot be combined with any additional offers. This promo ends April 24, 2019, at 11:59 p.m., Pacific, and is limited to one per customer and two per household while supplies last. Swych has the right to change, alter, or terminate the promotion at any time. This promotion is intended for Swych app users. This is not a credit/debit card and has no implied warranties. This card is not redeemable for cash unless required by law and cannot be used to make payments on any charge account. Lowe’s® reserves the right to deactivate or reject any Gift Card issued or procured, directly or indirectly, in connection with fraudulent actions, unless prohibited by law. Lost or stolen Gift Cards can only be replaced upon presentation of original sales receipt for any remaining balance. It will be void if altered or defaced. To check your Lowe’s® Gift Card balance, visit Lowes.com/GiftCards, call 1-800-560-7172 or see the Customer Service Desk in any Lowe’s® store. LOWE’S® and the GABLE MANSARD DESIGN are registered trademarks and service marks of LF, LLC. Lowe’s® is not affiliated with Swych. 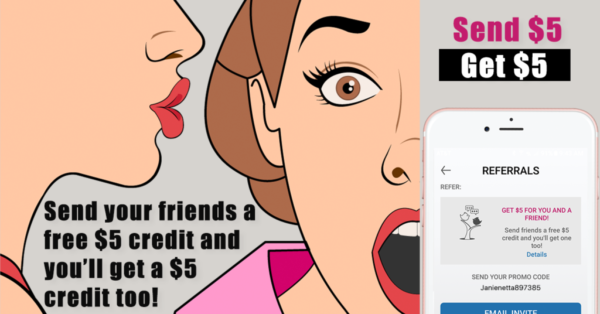 Send your friends a free $5 credit and get $5 in too! This offer is only valid for all customers, up to a total of 10 referrals. Recipients can only use 1 referral on their first purchase. Every NEW user who signs up for a Swych account with your referral link or referral code will receive $5 off their first purchase. Once they have made that first purchase using your referral code, you will be credited 500 points (worth $5) to use toward your next purchase. Note that promo codes cannot be combined with referral codes. That means, if your referral code is not used during checkout, a reward credit will not be issued to your account. Points are applied to your account once per day within 24 to 48 hours of a verified transaction. A maximum of 500 points will be credited in any given 24 hour period. Points earned in excess of 500 will be credited in increments of 500 points daily or until all earned points are credited or until the lifetime limit of 10 referrals or 5000 points is reached, whichever comes first.